Kay is a motorcycle enthusiast who enjoys camping, cooking, friends and family. 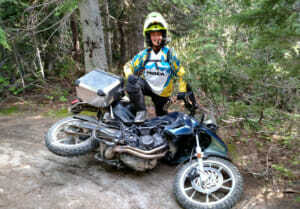 Semi retired from the grocery retail industry she now enjoys her free time adventuring on 2 wheels. As an accomplished rider on diverse surfaces, Kay’s current motos include a KTM 250 XCW for technical single track, a Beta 500 RS for exploring forest service roads, and a BMW F650GS twin for traversing the Backcountry Discovery Routes.